The following was originally printed in Second Life Newspaper in May 2009. If you’ve ever been at Luskwood (or the Cutlass Club), you may have noticed a resident so small, it’s hard to find him without looking for his nametag. This would be Lomgren Smalls. Having long been known for his six-inch high avie, and to a lesser extend occasional custom work on micro (and mega) avatars, he has made a little real-life news recently. I recently had a chance to talk with him. 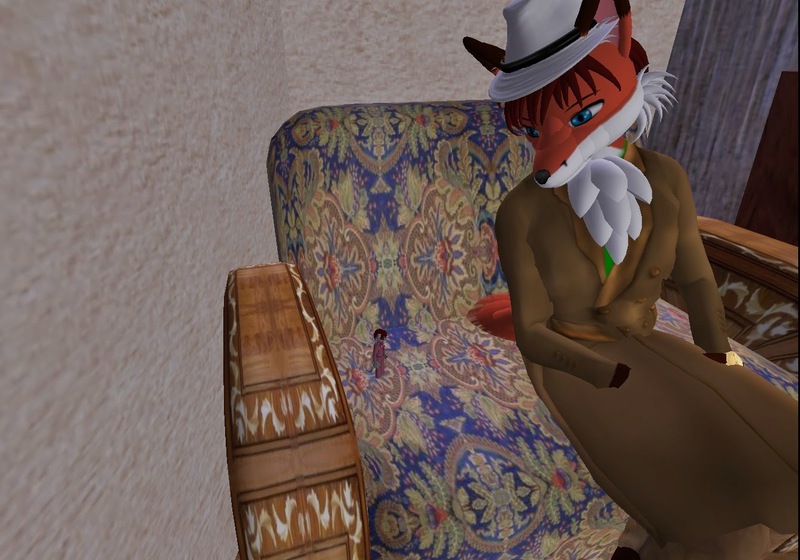 Bixyl Shuftan: Where did you first hear about Second Life? Lomgren Smalls: Well, I had heard about it several years ago, back when I hadn't even thought of joining. Probably a good three, four years, maybe more than that. I think it was probably during 2006, because that was my first year being at the El Goonish Shive forums at Keenspot (El Goonish Shive is an online comic). Bixyl Shuftan: So what got you to take a look? Lomgren Smalls: Well, I joined the Trillian Astra alpha back in early Jan 2007, or maybe Dec 2006. Trillian Astra is the next version of Trillian, which is an IM client aggregator of sorts. It allows you to connect to multiple IM Networks. AIM, ICQ, Yahoo, etc. One of the first people to add me as a friend on the Astra network was a furry on here already, and finally convinced me to go ahead and try Second Life. Thus, my born date is late January 2007 ... but when I tried it ... it was so laggy that my avatar never loaded. So I gave up on it again. I finally decided to try again on March 3rd, 2007. Made it in, things loaded, and from there, met new friends, etc, and haven't left. Bixyl Shuftan: Sounds like things went well once you started. Lomgren Smalls: *chuckles* As well as can be expected with SL. Bixyl Shuftan: When did you first start building, and how did it lead to your work on avatars? Lomgren Smalls: The picture was after it had been refined a bit and I was trying to package it for possible sale. But the last part of the original that I have was built and finished on Apr 1, 2007. I have tweaked it since then. Lomgren Smalls: So, I was building from the very beginning. It took me about 6 months in SL to learn enough to make the original base of this av. But the main thing about me and building ... I love a challenge, and seeing just what I can do. Bixyl Shuftan: Yes, looking at you, it's obvious someone did quite a bit of work on how small one could make an avatar. How did this begin? Lomgren Smalls: Well, back to the El Goonish Shive forums, it was there that my online persona became a 6 inch tall male anthrofeline, if you want to describe it formally. So, naturally, one of the things I wanted to try and do in SL was make myself, well, myself. One of the first things I got was the original NorthStar micro, with help, as a kit. It was actually twice my current height, about a foot tall. But I customized it and eventually learned enough to make it move. I then took what I learned with that and made my own. Including my own animation and such to get it to work. Bixyl Shuftan: How long did it take before it was fully ready? Lomgren Smalls: Well, probably 20 hours at least, but I keep tweaking it and such. That was figuring out the scripting and figuring out how to shrink the head and tail down properly. The rest was me using the NorthStar micro as a pattern and trying to figure out how to improve upon it. Bixyl Shuftan: I take it your micro was a hit with everyone on first sight? Lomgren Smalls whispers: Hehe. A lot of people liked it, and I still get questions on "where did you get that?" and "how did you get so small?" Bixyl Shuftan: *chuckles* What have been some of the more unusual reactions to your micro? Bixyl Shuftan: Those who've read the paper for a while will recall you've also done work on macro avatars, super-large ones. Lomgren Smalls: Yes, I've done some work on megas before, mainly to see just what was possible. Most people were saying even a 30 meter av was impossible. But, me being a builder, I knew what link limits and root prims were, and how they affected things. So, I was able to design and piece together a statue-style mega avatar that was ... a lot larger than anyone expected was possible. Lomgren Smalls: It was actually for Halloween, because I was becoming known as a micro ... and I built the vixen for a friend, and I made a mega version of my own regular av, around 65.5 and 68 meters tall, respectively. Bixyl Shuftan: Did the work take about as long as your micro? Bixyl Shuftan: How easy is it to move in the megas? Lomgren Smalls: Not easy. You literally have to fly them around. And hover, making them appear to stand on the ground. Bixyl Shuftan: Do they lag a lot? Lomgren Smalls: Not really. They are made of normal prims. Bixyl Shuftan: So what other work have you done since then? Lomgren Smalls: I do all sorts of work. I build stuff other than avatars. Everything here on my property, for instance. I've also built stuff for friends, castles ... let's see. I've done commissions, for micros, other avs... one of them was for The Phantom Creeps robot used by Rob Zombie in a few of his videos. So, just in general, a little of everything. Most recently, I've been finishing up some work on a couple of micros that I can actually sell, Relay for Life. Bixyl Shuftan: What can you tell the readers about those? Lomgren Smalls: Well, they're going to be based a lot on my current outfit ... because this is my "Relay for Life" outfit. The main difference is that the head actually is built by me, instead of being a shrunken version of the Luskwood Cat. I also have a female version of the av in progress, just needs a little more work. Bixyl Shuftan: I've seen another micro done by you. About how many macros and micros have you made for others? Lomgren Smalls: Macros ... let's see ... maybe 2-3, if that. Micros ... closer to 8-10. Bixyl Shuftan: Changing the subject, you recenly got a real life job through SL. How did you hear about it? Bixyl Shuftan: Yes, and your getting the job made a little real-life news as well. The articles stated your micro made quite an impression. Lomgren Smalls: Yes. I know people probably think I'm crazy for going to a job fair as a micro, but to me, it makes sense. 1: it's who I am. 2: It shows what I am capable of doing. Of course, I was dressed for the occasion, wearing a dark gray tux. Bixyl Shuftan: Have your new fellow employees spoken much about Second Life, considering how you got the job? Lomgren Smalls: A bit, yes, as I've talked to them about it. They're happy with me working there, I'm happy working there, my boss/etc are happy with me. Bixyl Shuftan: Great ... As I recall, you were also on local TV news. Bixyl Shuftan: Besides the RFL avatars, any future plans that you'd like to share? Lomgren Smalls: Well, I plan on making non-RFL versions (of the avatar), and hopefully making a version 2.0 of the av someday in the future. To those who haven’t come across them, articles about Lomgren getting his state government IT job can be found here: http://assignmentfuture.blogspot.com/2008/09/finding-real-work-in-virtual-worlds.html . Lomgren would go on to put his "Lomtech" micro feline avatar up on the market. He also worked on an improved version of his existing avatar with more fluid movements, but whenever it danced, it would float a couple feet in the air. He never did find a way around that bug. 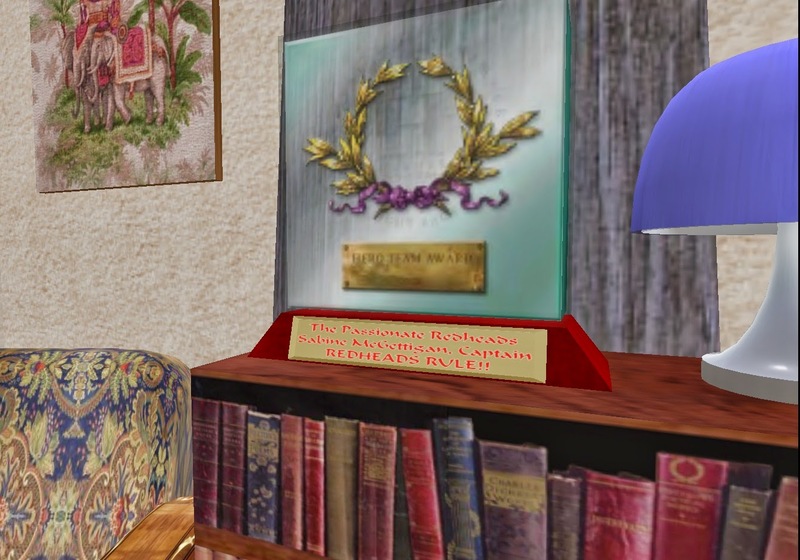 Lomgren remained a devoted member of the Passionate Redheads Relay for Life team. It's folding in 2013 was undoubtedly a bitter blow. He would go on to found another team, but shortly afterward, he took an indefinite hiatus from Second Life. I occasionally come across him in Facebook, Minecraft, and various Steam games. In the meantime, his neighbors in the Sunweaver community continue to talk about him, and wait for his return.